We are delighted to announce our first strategic corporate partner, with house-building company Mactaggart & Mickel. The company has signed an innovative, two-year partnership with us to provide vital life skills and practical support to Care Experienced young people when they move into their own homes for the first time. 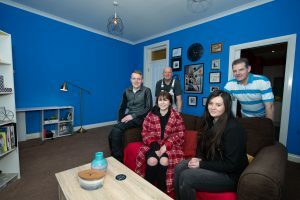 Teams of Mactaggart & Mickel employees have volunteered to carry out essential repairs and refurbishment when young people move into their own homes for the first time. 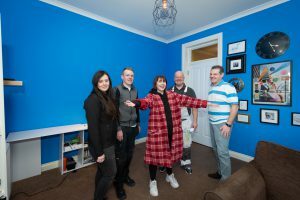 And they have chosen to celebrate Care Day (February 15) this week, by carrying out their first home refurbishment for our member, Lisa Moore who lives in Glasgow. 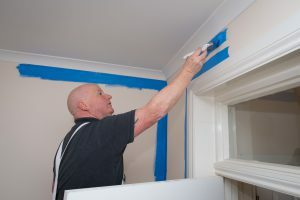 Mactaggart & Mickel painters, plumbers, bricklayers, roughcasters and other construction trade – together with Head Office staff – are being released from their ‘day job’ to carry out repairs and maintenance for Care Experienced people, many of whom lack a family support network to help them settle in. Marion Forbes, HR Director of Mactaggart & Mickel, said: “The idea was suggested by one of our Employer of Choice champions, who realised that we could harness skills that our staff already have to benefit those who may need a helping hand. Who Cares? Scotland is a national voluntary organisation dedicated to Care Experienced people. The charity provides advocacy to children who are in the care system, and campaigns to change policy, practice and legislation to benefit Care Experienced people. The charity is a membership organisation, representing the Care Experienced community. Mactaggart & Mickel are an award-winning family business with family values at their heart. They have been designing and constructing quality homes in sought-after locations since 1925. Their current Scottish developments are in Edinburgh & the Lothians, Glasgow, Renfrewshire, Ayrshire and across the Central Belt. Care Day celebrates, champions and connects the Care Experienced community with each other and those who care about them. The first Care Day took place in 2015 to commemorate the one-year anniversary of the Scottish Parliament unanimous passing of the Children and Young People (Scotland) Bill 2014. This was a significant moment in Who Cares? Scotland’s history as the evidence of 21 brave Care Experienced people helped change the Bill’s course and secure more rights for Care Experienced people in Scotland.